This is a very common type of vent system in houses that have gas furnaces. It is also referred as the Type B vent. It works on the principle of natural convection. 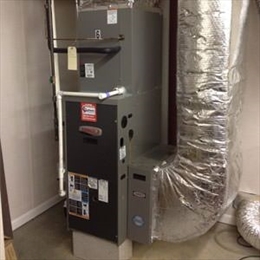 Type B vents are a standard design that most modern gas furnaces use. These vents draw air from inside the house for combustion. Once the combustion takes place, hot gases are produced. The hot gas being lighter quickly rises through the vent and is exhausted out. These flues are set vertically to expel combustion air through the roof. They offer some advantages such as installation is quite easy and cost effective. However the main demerit of this type of exhaust system is that they are quite liable to back drafting. Exhaust gases can find their way back into the air distribution system. This often becomes the root cause of carbon mono oxide exposure. Direct vents have a pair of pipes one big another small. The big pipe is used to extract air from outside for combustion. The air will be blown across the heat exchanger to get heated. It will then be released into the room as warm air via the fan. The smaller pipe is used to vent exhaust gases of this ignition process. The pipes are set both horizontally and vertically. Horizontal setting allows the gases to be exhausted through a sidewall. Vertical installation can also be done to let the gases out through the roof. The main advantage of this type of vent system is that you do not need a chimney whether horizontal or vertical installation is used. It is quite easy to install. Direct vents also cause less environment pollution as they tap most of the combustion heat. It has a low risk of back drafting. This type of vent system is also referred as induced draft fan. A fan is fitted at the end of exhaust duct to draw the combustion gases and expel them out. The fan works in tandem with the furnace. In fact it starts running as soon as the furnace is powered on. These systems are great to eliminate cumbersome chimneys that we see in old houses. They are affordable and rated high for their safety and efficiency. 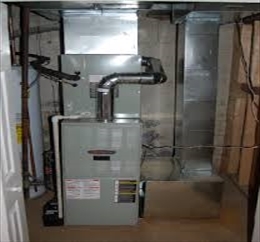 However these venting systems used in conventional furnaces will not work for condensing furnace. This is because of a different kind of exhaust process. A condensation furnace requires a special kind of venting pipe. The heat is extracted from the fuel during the combustion process for a longer period of time. It is two- tier process. In the first step, the heat from the combustion is sent to the heat exchanger. It is used to warm the air. The exhaust that goes out due to the combustion is not allowed to get out of the house through the chimney. It is sent to the second exchanger. The exhaust vapor is "cooled" and condensed. The heat that is given out due to condensation is used to heat the house. Low temperature gas and water condensate drips out of as exhaust. These require special plastic pipe to be vented out. What type of venting material is required? You will select one among these depending on the furnace’s designed exhaust gas temperature. The plastic types that are specified above can withstand various degrees of temperature. PVC is lowest among these. It can tolerate a maximum temperature of 140 degrees F. ABS has maximum toleration level of 160 de grs F. CPVC has the highest at 194 degrees F. If a pipe is made to bear a temperature level that is more than what it can withstand it will sag or leak. In this regard it is worth mentioning that there is a lack of industry standard about using pip types in condensing furnaces. According to The International Fuel Gas Codes “Plastic pipe and fittings used to vent appliances shall be installed in accordance with the appliance manufacturer's installation instructions.” Although manufacturer specifies which types of piping is suitable for their products they leave it up to the installing contractor to determine which plastic type to be used.